As I walked my dog through the knee-deep snow this morning, I felt a little bit like Yuri Andreyevich Zhivago, trekking his way across Siberia. 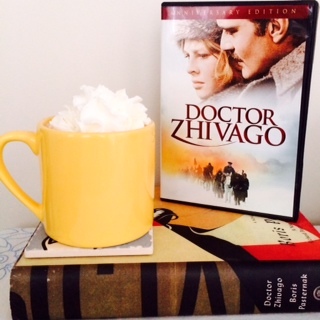 Okay, maybe it wasn’t that bad, but this total bombardment of wintry weather is making me crave my favorite snowy day movie, and since I have no place to be today, I might just hunker down with some hot chocolate and bask in the brilliance of Doctor Zhivago. Doctor Zhivago is one of the very rare instances where I actually love the movie even more than the book. (Insert: gasps and accusations of blasphemy.) Don’t get me wrong—I think Boris Pasternak’s Nobel Prize-winning novel is beautiful and important and wonderful and I absolutely love it, but there is something about the 1965 David Lean film that fills my whole heart. Omar Sharif is nothing short of perfect as the conflicted, romantic poet-slash-doctor, Zhivago. Geraldine Chaplin is endearing and sympathetic as his wife, Tonya. Rod Steiger is both chilling and complicated as the villain, Komarovsky, and Julie Christie, as Zhivago’s true love, Lara, conveys so much of the story through her eyes alone while also looking super cool despite sub-zero weather. Set against the dramatic backdrop of the Russian Revolution and the First World War, Doctor Zhivago is at its core a story about people—particularly, two people who fall in love despite, or even because of, the world crumbling around them. It takes a good long while for Zhivago and Lara to actually meet, but the idea of their love story is there from the very beginning, and every time their paths cross, the excitement of what’s to come builds more and more. As a viewer, I love them together before they even know each other’s names, and that’s pulled off by Pasternak’s story, the legendary score, the perfect screenplay and direction, and, of course, Sharif and Christie’s mesmerizing performances. It may seem difficult to get behind a love story that centers on adultery, but Yuri Zhivago truly is a man divided in every sense. He’s a doctor and a poet, a man of peace in a time of war, loves his wife, yet desperately loves his Lara. With every word Yuri and Lara speak to each other—even a simple “How are you?” or the utterance of a name—you feel the complete passion between them deep into your bones. If it weren’t a time of war, and if the life Zhivago knew and loved wasn’t stripped from him, maybe he never would have acted on it—but as he loses everything, as he sees those around him being defeated or giving up, he always holds onto that one dream of Lara. It’s beautiful, and it’s true, and they even make an ice palace look romantic. It also puts things in perspective when I look out the window and see the snow outside. 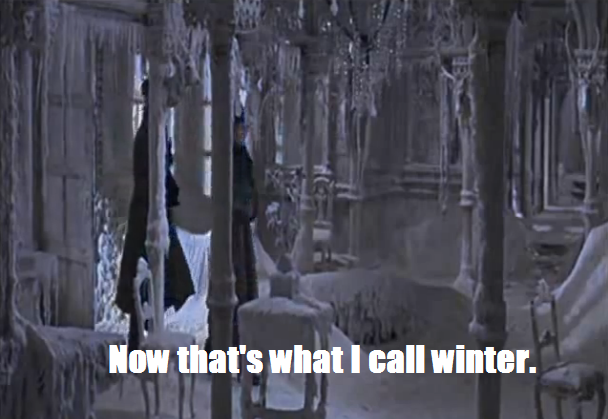 At least I can comfort myself in the fact that there aren’t icicles all over my lamps and end tables. This movie puts me through a smorgasbord of emotions. I love to hate Monsieur Komarovsky. I appreciate that the agony will give me a good, cathartic cry. I sigh at the romanticism of The Lara Poems. I kind of wish that I knew how to play the balalaika, and I definitely feel the frigid temperature of the harsh but beautiful Russian snow. Or maybe it’s just that blizzard that’s happening outside right now. I don’t need a reason to watch Doctor Zhivago, but I’ll take one when I get one, and Mother Nature seems to be giving me a good one today. To my fellow snowbound readers, I hope that you’re staying warm and doing something you enjoy as much as I enjoy this movie. For my readers in the warmer climates…I hope you’re doing something fun too. Just try not to rub it in. Do you have a favorite snow day movie, book or tradition? Share in the comments! I think that I am the only person who has NOT seen Doctor Zhivago but after reading your review I feel as though it is a movie that I would surely love! Thanks for all of your wonderful reviews!! I think/know that you are a fabulous writer/author!!! Thank you!!! It’s one of my very favorite movies. I just get enjoyment recommending the things I love and hope my reviews will help people find books and movies they’ll enjoy! I’ve never seen this either! I considered watching it on one of the many snow days, but my roommates shot it down as too depressing. Unfortunately, they’re on the lease, so I couldn’t order them from the house, but I considered it. Next time . . .
Hm…I can see where that could be a problem. I definitely recommend watching it when you can, though! It is SO good!